MapSource City Navigator Europe NT on DVD contains detailed road coverage of major metropolitan areas in Europe. Navigate with confidence having motorways, highways and residential streets at the tip of your finger. 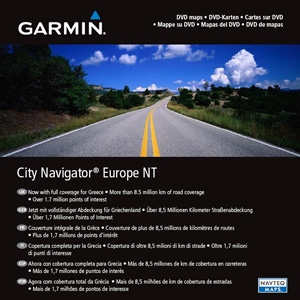 City Navigator Europe NT provides automatic route calculations with turn by turn directions on the PC and on NT compatible Garmin units. The data also contains points of interest such as: food and drink, lodging, border crossings, entertainment, shopping, emergency services, petrol stations and more. City Navigator NT makes looking up an address quick and easy and you can even create your own customized waypoints and routes to meet all of your navigational needs. Let Garmin and City Navigator Europe NT help put the fun back in travel. With this purchase, you'll have access to the entire DVD coverage.